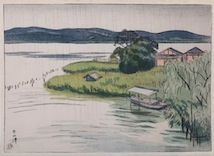 " Rainy Day in Katyamazu, Kaga "
" Scenery of Nara "
print techniques from Hashimoto Kenzo, which led him to become a print artist. 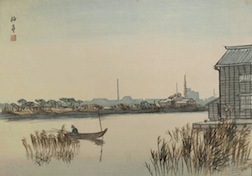 of the Emperial University " and "Woman Playing the Mandoline"
In1954 he engraved "Cormorant Fishing" and some other pictures by Kawase Hasui. "A Rainy Evening of a Western City"
English for Utsunomiya Junior High School in Tochigi Prefecture. 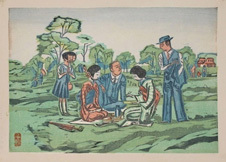 newly civilized Japan in Meiji Period. with both his personality and his works. zine 'Tsukuhae'. together with Tanaka Kyokichi and Fujimori Shizuo. which duly brought him the reputation as one of the three giants in this genre of art. 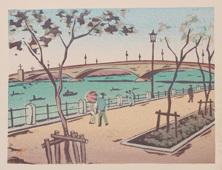 He published " Modern Girls" (A set of10 ten prints) from Kato Institute of Printing. 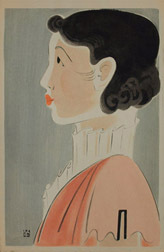 1896 Born in Kambara district in Niigata pref. 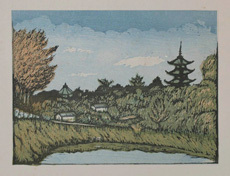 Kanenori in1921 and given lessons for making prints, he decided to be a print artist. 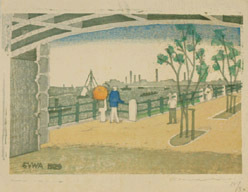 1922 Started to exhibit his works from the 4th exhibition of Japan Creative Print Exhibition. 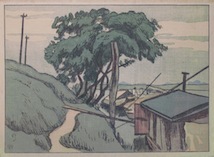 1928 Founded Takujosha Group together with Hiratsuka Unichi and Onchi Koshiro. This plan was proceeded at his suggestion. 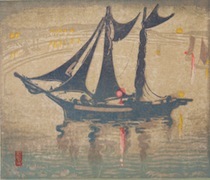 1931 Joined other artists to found Japan Print Association and exhibited his works thereafter. 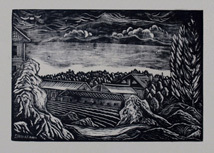 Such print magazines as 'Poems and Prints', 'Port' and 'Prints' also included his works. 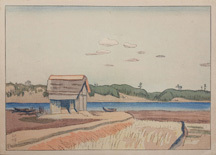 His works often dipict vast scenery or fruits and vegetables in a light and witty tone. 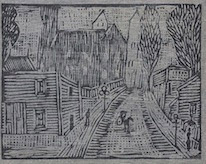 .Print Association, he was determined to be a print artist. 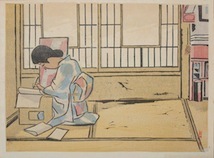 to Nihonga, Japnese style painting, under the artist name Kouho.